My husband and I always said that when our daughter turned 5 we would throw her a huge party. We kept her alive for 5 years, lets celebrate! It was an exciting moment for us, for her, and for all the Grandparents. I started planning about 3 months out researching and Pinning different party ideas. Then I asked my daughter what type of party would she like and with no hesitation she responded with, “A Hello Kitty Party”. No surprises there. . Since it was May in So Cal, we figured a back yard party at my in laws would be great. I decided on a few entertainment items, a bouncer (keeps the kids occupied for hours! 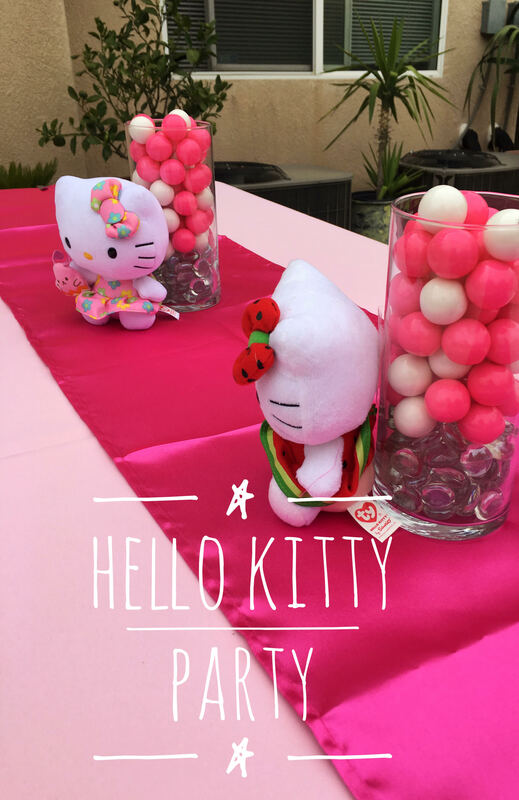 ), a ball pit in a kids blow up swimming pool (we already owned tons of colorful balls), and one more thing to make it memorable, an appearance from Hello Kitty herself. The tricky thing about Hello Kitty as an entertainer is she doesn’t talk, so I thought how will this be any fun for the kids? I found a place that said they would do face painting for the first hour and then for the remaining half hour bring out Hello Kitty and just have her take pictures with the kids and be present for when “Happy Birthday” was sung. Well, Hello Kitty didn’t say a word and the kids had an amazing time taking pictures with her and she even sat at the table while the kids did a craft. Another important part of the party was having the right decor. 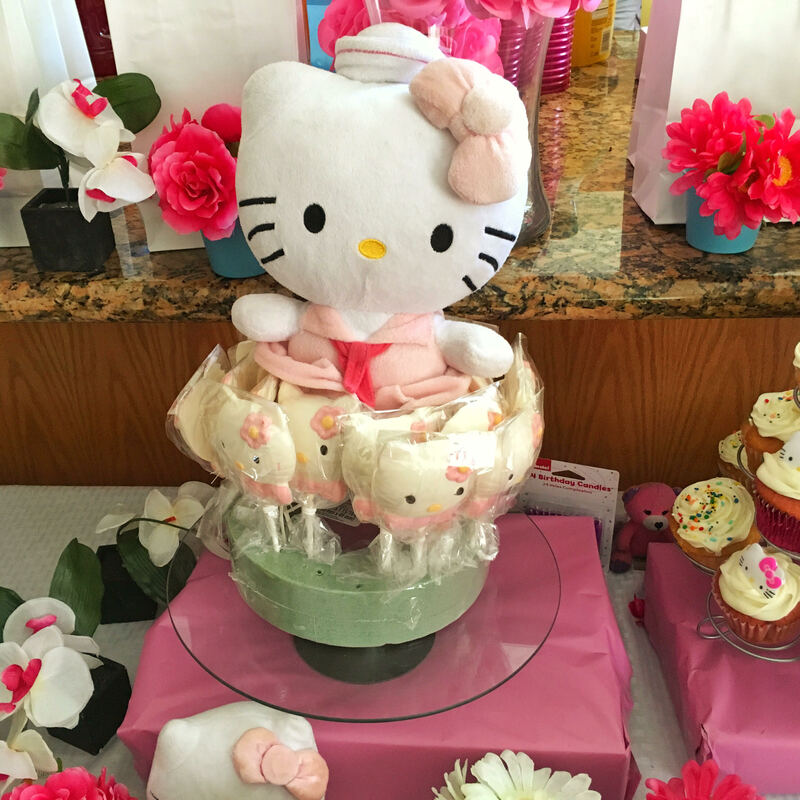 Luckily Hello Kitty is so popular that it is easy to find things in store and online. I wanted some decor that could be used again. 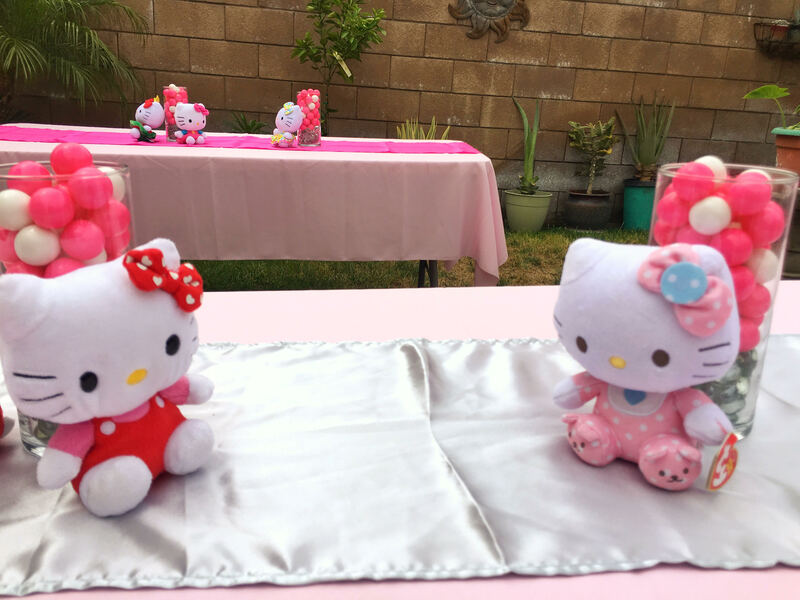 So, I found a bunch of cute used mini Hello Kitty’s on ebay that were in all different outfits. We had a Christmas one, Halloween one, a baby one etc. I had to buy from 3 sellers to get the right number of stuffed animals. These were great. I sat them on the table next to some vases (from the Dollar Tree) filled with pink and white gum balls with clear rocks on the bottom. 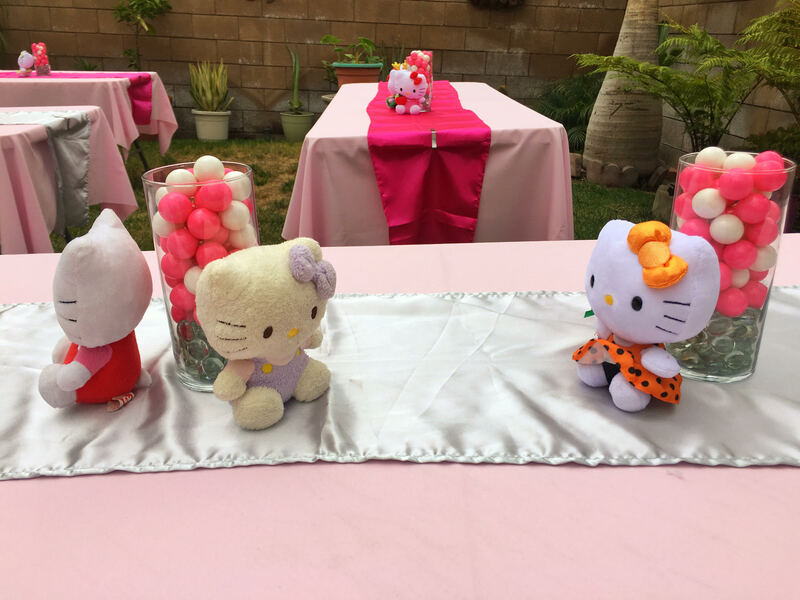 I had 2-3 Hello Kitty’s per table and we were able to give some away to a couple cousins and the rest my daughter took home to play with. I covered the tables with light pink table clothes and had hot pink and silver table runners that I found on Amazon for $5 each. I thought what better way to entertain kids than with a candy bar. The parents hated me but the kids couldn’t get enough. 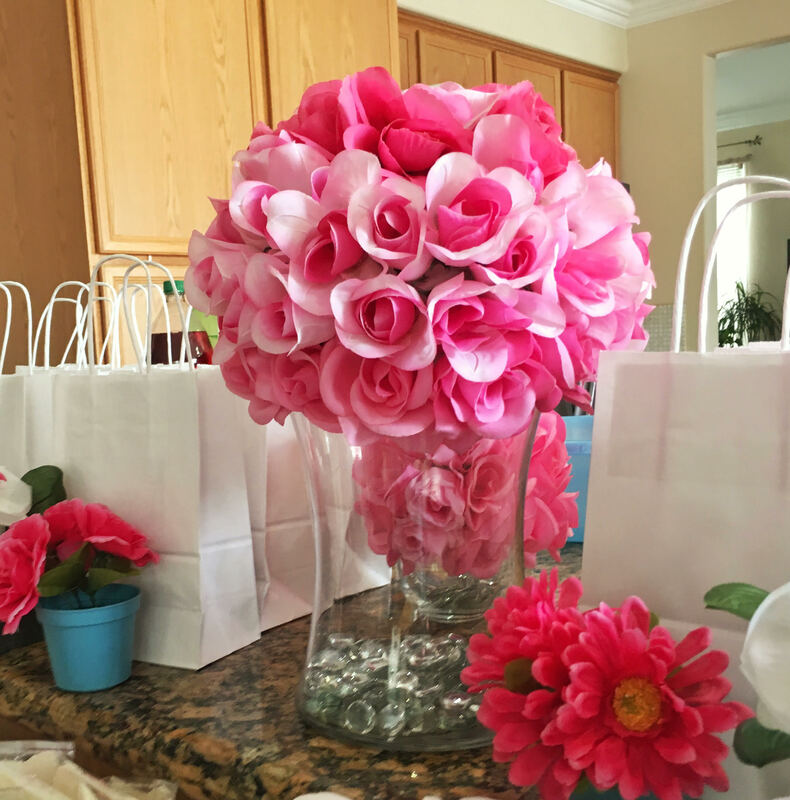 I created some flower centerpieces. I went to the Dollar Tree and bought a styrofoam ball and some pink fake flowers. I pulled out each flower and used a pin to pin it into the ball and set it on top of some clear vases filled with clear rocks. I also got a bunch of cute fake pink flower in little blue pots from the Dollar Tree that I was able to put all around. I also had Hello Kitty candies that my Mother in Law was kind enough to make, as well as tons of bowls of candy from Costco. I put out plastic candy bags for the kids to fill up and take home with their goodie bags. This table also had the cupcakes and brownies (I’m terrible, I know!). 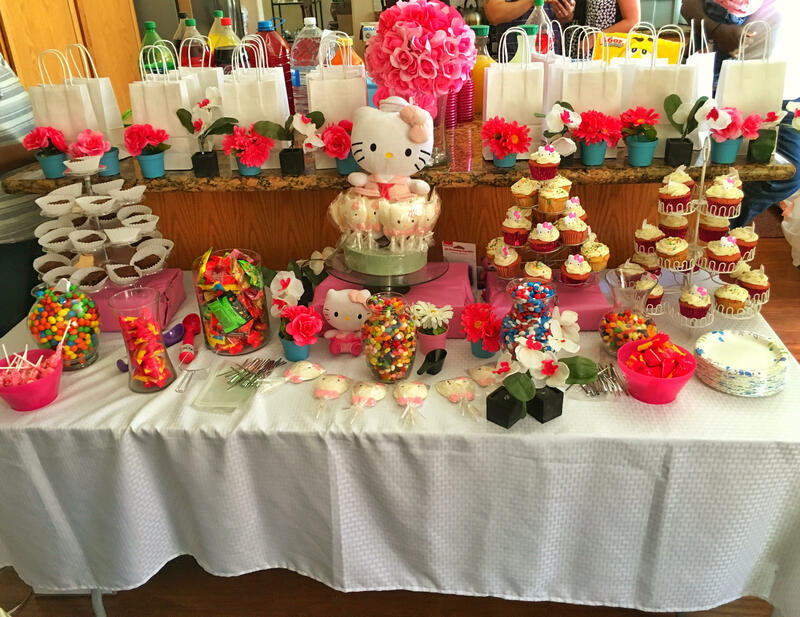 To add some height to certain items, I wrapped some boxes in pink wrapping paper and put some of the cupcake holders and Hello Kitty candies on the boxes. The party worked out great. The kids had a blast!